The time for yield adjustments is very close at hand, and our thesis is that, even assuming normal weather across the Eastern Corn Belt over the next 30 days, US national corn and soybean yields will be revised downwards 2-4% in NASS’s August crop report. The graphic above features a newly released tool that better measures the effect of flash drought, vs. the long established Palmer drought index, which is much more long term in nature – but can at times do a poor job of measuring the impact of dryness on crop development. 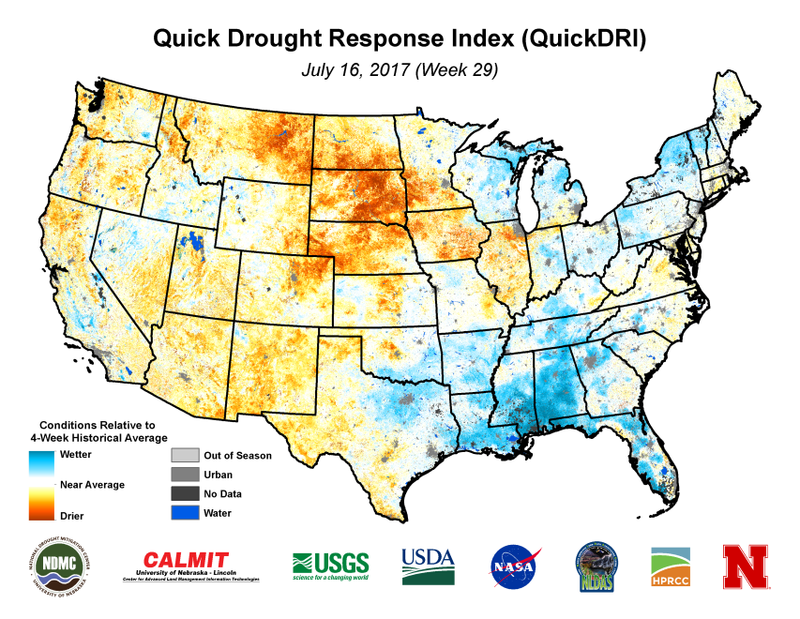 Compared to traditional US drought monitor, which keeps severe conditions isolated to the Dakotas and Montana, the quick drought map better shows this year’s expansive loss of soil moisture. As such, we at AgResource have begun to trim harvested area and yields across Nebraska and South & North Dakota. Our work indicates a combined yield there 12-14% below trend, which along with a slightly higher abandonment rate results in production of 2,487 Mil Bu. This compares to a trend yield there in 2017 of 2,893 Mil, and so already some 400 million bushels will be stripped from US production. This could results in end stocks closer to 1.9 billion bushels, vs. the USDA’s last forecast of 2.3 billion. 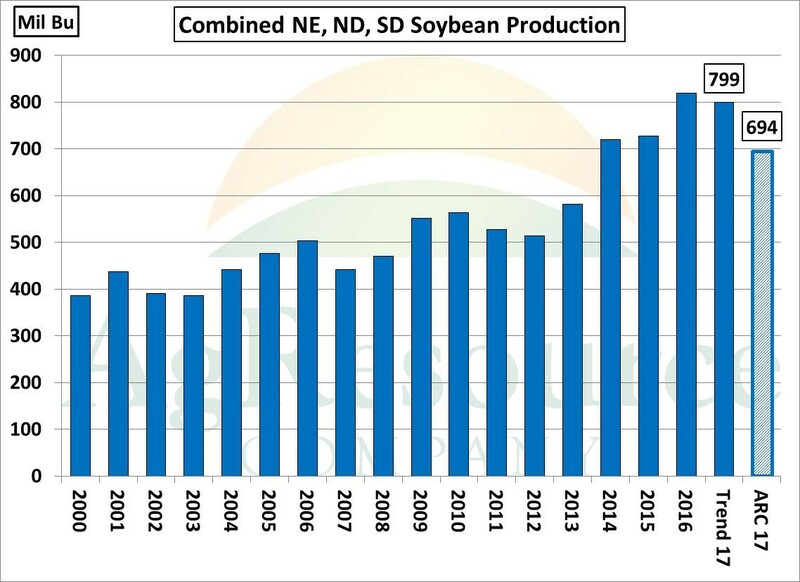 In soybeans, our model suggest combined production in NE, SD and ND of 694 million bushels, vs. an implied trend production of 799 million; a decline of 105 million bushels. 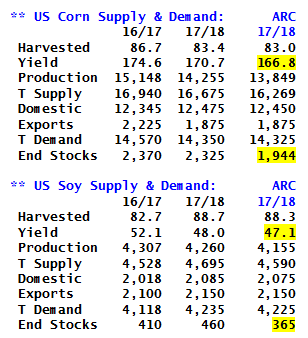 Completed balance sheets, using the numbers discussed, are above, and notice that they tighten noticeably when only production across the Central Plains is adjusted. 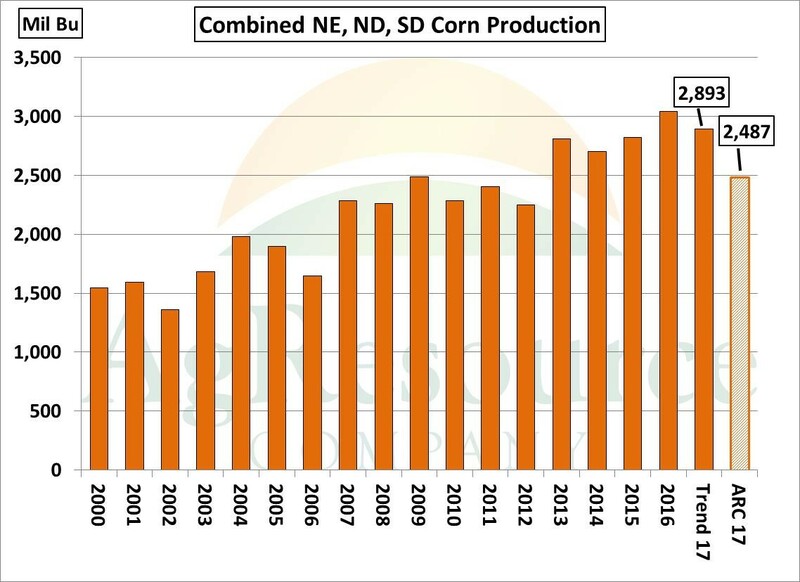 For this reason, we doubt any break in the market can be sustained until crop size is better known, which likely awaits the USDA’s September release.